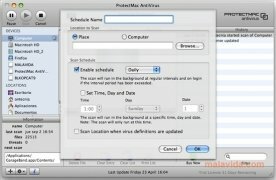 ProtectMac AntiVirus is a complete solution to avoid that our computer is infected by any malware on the Internet or any file that is launched from our computer. It has an interface that is similar to the Mac OS X file explorer, Finder, thus making it very easy to control and configure. It has a system that practically doesn't affect the performance of the computer, which is very important, specially if we use applications that require the use of the vast majority of the computer's resources, like design, video editing and audio production applications. - Real-time analysis of the drives. - Integration of the context menus. - AIS (Adaptive Intelligent Scanning) system, to manage a better performance. If you still don't have a protection system for your Mac that is practical and efficient, you should try ProtectMac AntiVirus, a complete solution to avoid that the virus and spyware applications affect your computer. You can try out the application for 30 days. Minimum operating system requirements: Mac OS X 10.8.